The Chipmunk Program for 4 – 6 year olds and the Red Squirrel Program for 7 – 11 year olds make it possible for the whole family to attend the Art of Mentoring. Children spend the week exploring the natural world with the guidance of a regional network of instructors. The programs includes sensory awareness games and exercises, earth living skills, arts and crafts, music and storytelling, and getting to know the natural world. Children learn these skills and knowledge through creative play and mentoring that taps into their unique interests and passions. The format of programs is similar to a day camp running from Tuesday morning through Saturday morning. (Monday the children are fully incorporated in community events with their parents.) The children’s program makes it possible for parents to participate in most workshop activities throughout the week. However, parents must supervise their children at all meal times as well as during the early evening and bedtime. For this reason, at least one parent will not be able to participate for the entire evening workshop session. Some families in the past have brought a caregiver for a child age 4 or 5. Feel free to contact us if you want to talk over what options might work for your family. The Oaks and Acorns Program began two years ago, and was a huge success! Parents and little ones spend their days together playing, exploring the woods, and practicing the core routines of nature connection. Songs, games, stories, naps and snacks are also part of the adventure, along with activity sessions and “parent time” talking circles. 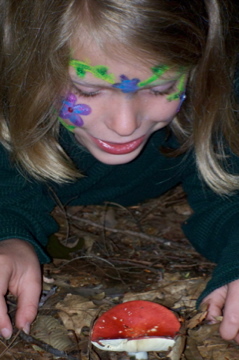 Learn about mentoring young children in nature, and how to plan for a lifetime of growth in yourself and your young one, with this program designed to produce a healthy, happy, nature connected child. This program is for children age 0-3. Each child must be accompanied by one adult parent or caregiver. Parents in the Oaks and Acorns do not participate in the Art of Mentoring Adult Program. However, certain events throughout the week are inclusive of everyone present, young and old. See the main Art of Mentoring page for registration details.